In the thirteenth of his Olimpyan odes, Pindar tells that the prince of Corinth, Bellerophon, suffered for a long time in the attempt to ride the untamed winged horse, Pegasus. It is not hard to imagine why he wanted to mount him at all costs. He was a prodigious animal, born from the ground bathed in the blood of Medusa or, according to others, even sprung from his neck when Perseus cut it with a sickle, killing her. The horse immediately flew to the abode of immortals and from then on lived in the house of Zeus, bringing the lightning and the thunder to the Father of the Gods. One day, however, he stopped near the Peiréne source, not far from the city of Corinth. The prince saw him and tried to approach him, but the horse defended himself wildly. And yet his violence and arrogance increased the desire of the young man to ride him. Exhausted, Bellerophon turned to the diviner, Polido, who advised him to sleep in Athena’s temple. As soon as he fell asleep, the goddess appeared to him in a dream. Handing a bit made of gold rings, she whispered him to take it and to sacrifice a bull to Poseidon. Immediately the hero awoke and found the divine instrument at his side. He ran to Polido to tell him what happened and he told him to obey the dream and dedicate an altar to Athena Hippia. The power of the gods, says Pindar, does easily what would be sworn impossible. So, thanks to the prodigious bit, Bellerophon immediately subdued the fiery flying horse. As soon as he put the bit in his mouth, he could jump on his back, wearing his bronze weapons, and they immediately performed a warrior dance. Then, on his back, the hero defeated the Amazons, killed the Chimera and routed the Solimi. The story of the taming of Pegasus presents several points of interest. Besides in Pindar, it occurs in Hesiod (Theogony) and in several other authors, while Homer, who speaks of Bellerophon (in the sixth canto of the Iliad), does not mention the winged horse. Poseidon is qualified with the name of damaios, which means “tamer”, to emphasize the intimate connection of this deity with the horses, which makes him the protector of riders and charioteers, as well as the tutelary deity of the equestrian games. 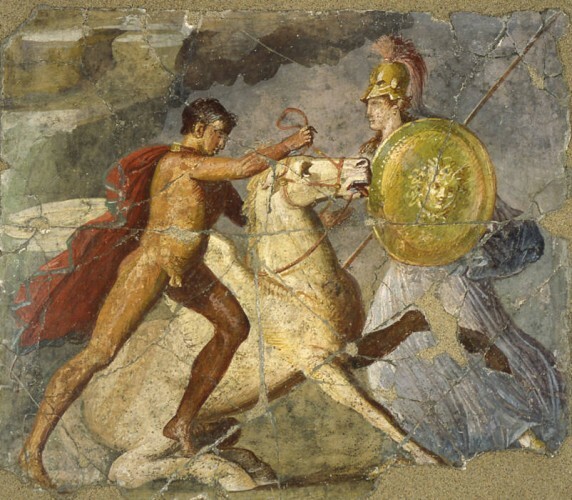 Athena also appears there as the goddess of Equestrian Art, bestower of the instrument that, by the force of an enchantment, can “win the mind” of the wild animal. 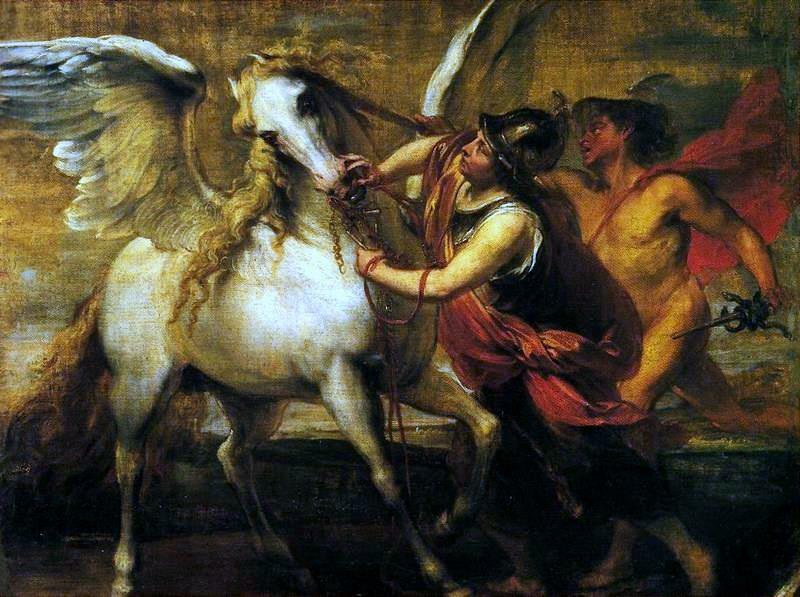 Above all, however, the taming of the horse is seen here as a unique moment in which, thanks to a divine instrument, the hero manages to subdue the animal, that from unruly and violent, becomes immediately docile. Especially striking is the role of the bit as an essential tool of communication between man and horse. This anticipates a trend that will have a particular development during the Renaissance, when the art of “bridling”, which is the ability to choose the correct bit for each horse, will be considered “the true touchstone of the horseman” (Claudio Corte, Il cavallarizzo, 1562, p. 80r). Dear Martha, in the thirteenth Olimpyan ode, Pindar explicitly says “Bellerophon, who once suffered greatly when beside the spring he wanted to harness Pegasus, the son of the snake-entwined Gorgon;  until the maiden Pallas brought to him a bridle with golden cheek-pieces”(http://www.perseus.tufts.edu/hopper/text?doc=Perseus%3Atext%3A1999.01.0162%3Abook%3DO.%3Apoem%3D13). That’s why Pallas was considered the inventor of the bit (as you can see in Robert Graves, The Greek Myths (1955) (https://www.amazon.com/Greek-Myths-Complete-Robert-Graves/dp/0140171991/ref=sr_1_1?s=books&ie=UTF8&qid=1483461598&sr=1-1&keywords=robert+graves+the+greek+myths).